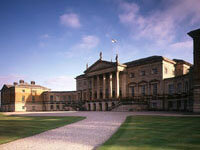 Kedleston was built between 1759 and 1765 for the Curzon family, who have lived in the area since the 12th century. The house boasts the most complete and least-altered sequence of Robert Adam interiors in England, with the magnificent state rooms retaining their great collections of paintings and original furniture. The Eastern Museum houses a remarkable range of objects collected by Lord Curzon when Viceroy of India (1899-1905). The gardens have been restored in part to an 18th-century 'pleasure ground' and the surrounding park, also designed by Adam, includes a fine bridge, fishing pavilion and series of lakes and cascades. All Saints' Church (in the ownership of the Churches Conservation Trust) is the only survivor of the medieval village of Kedleston, and contains a collection of monuments and memorials to the Curzons.